When someone in the United States is in need of a blood transfusion every two seconds, everyone who can needs to give blood. A little needle is nothing compared with saving a life. Blood helps to save the lives of accident and burn patients, premature infants, heart surgery patients, organ transplant recipients and individuals fighting cancer and forms of leukemia. Five hundred fresh pints of blood are needed every day to keep up with the high demand for blood. Only four out of every 10 people in the United States are able to donate, yet only one in 10 actually does. Giving blood saves the lives of those people who are in need. Donating one pint of blood can save up to three lives. Donating costs no money, just about an hour of time for the whole process. It only takes about five to 10 minutes when giving blood. Donors can receive a free t-shirt, snacks or a pint of ice cream depending on the blood bank. Blood Source is a huge blood bank in Northern California and they make it a point to come out to different areas and schools, like American River College, in their buses to make it convenient for people to donate. A lot of people only donate when they see the buses at their schools but, to keep up with the high demand of blood that is needed, people need to start donating more often. People can donate a pint of blood every 56 days and should make it a priority to do so, but if everyone gave three to four times a year there would be enough to meet the demand and prevent shortages. Many say that they do not want to donate because they are afraid of the needles, but it’s certainly less scary than whatever the one in need of a donation is facing. 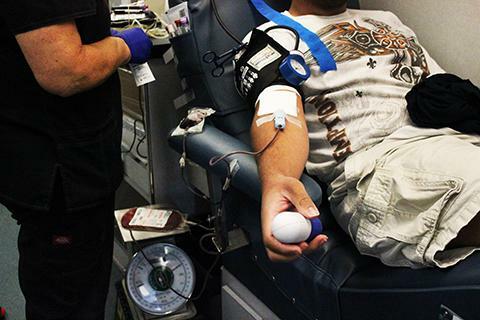 Be the first to comment on "Opinion: Everyone who can should donate blood"